Property tax reform remains an important focus for the legislature in 2017-18, with a property tax elimination proposal taking center stage. While a bill has not yet been introduced in 2017, we assume that the proposal will be similar to that offered in past legislative sessions. The co-sponsorship memo for the bill states that the bill will prohibit school districts from levying a property tax on or after July 1, 2017, with the exception of a limited property tax necessary to fund the debt service existing in a school district as of December 31, 2016. Like past versions of the bill, we expect that to replace local property tax revenue, the statewide PIT would increase from 3.07% to 4.95% and the statewide sales and use tax would increase from 6% to 7% and the list of items and services to which the tax would apply would expand to include the majority of services (such as legal services and mental health services) as well as items such as most food and clothing. The revenue raised as a result of the increase and expansion of the PIT and SUT will be placed into the Education Stabilization Fund to be used to distribute revenue to school districts annually. 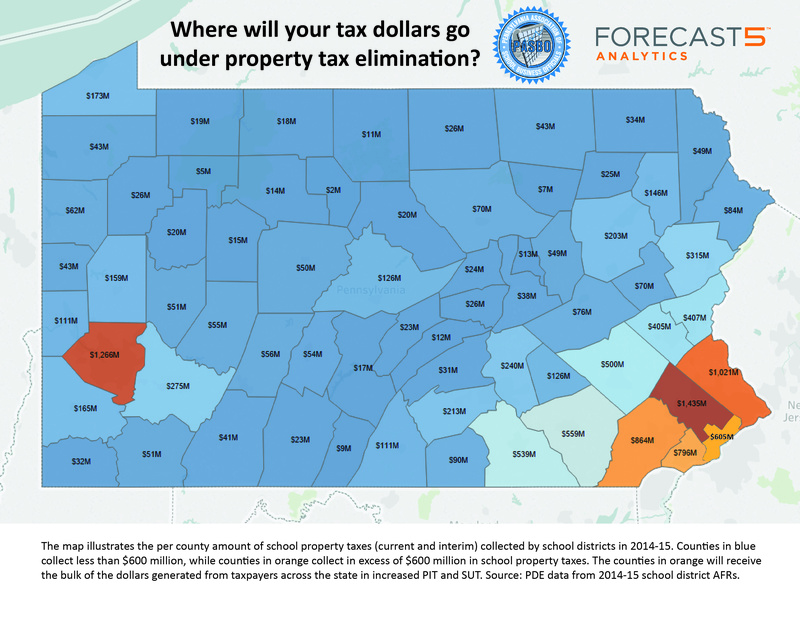 In the first year of implementation, the state would provide each school district with the same amount of funding (from the Education Stabilization Fund) as their local property tax revenue in 2016-17 and their property tax reduction amount from 2016-17 minus the amount of property tax revenue still allowed to be collected by the district to correspond to their outstanding debt. The bill also provides for an annual adjustment in the funding amount provided to school districts, providing an adjustment for each district that is equal to the lesser of the percentage increase in the statewide average weekly wage or the average percentage increase in the SUT, the PIT and hotel occupancy tax. In subsequent years, school districts would receive from the fund the amount they received in the prior year plus the appropriate adjustment. All of this assumes that there is sufficient revenue to distribute the appropriate adjustments. Regarding the timing for distribution, the bill provides no guidance and states that the Department of Education in consultation with the Department of Revenue will determine the timing and manner of distribution of funds to school districts. To determine the amount of property taxes that school districts can continue to levy, districts will be required to annually report and the state required to annually certify the amount of their outstanding debt that was in place as of December 31, 2016 (if you’ve issued debt AFTER that date, you will not be able to maintain a property tax to cover any portion of that new debt) and the levy approved annually. The bill provides for some very limited ability of school districts to raise revenue by allowing them to implement or increase a local EIT or PIT with voter approval. The bill also prohibits school districts from incurring any new debt without a voter referendum tied to an increase in local EIT or PIT. Click here to read the last iteration of the bill from November 2015. Click here for a list of implications of eliminating property taxes. Click here for a one-pager for parents. Click here for a one-page for taxpayers. Click here for a one-pager on the remaining school property taxes due to existing debt. Click here for data on the percentage of property taxes that would remain to pay existing debt. Click here for a one-pager on the inequity in funding under elimination. Click here for a map showing the property tax revenue by county. Click here for a press release on the shift from businesses to individuals. Click here for a one-pager on the shift from businesses to individuals. Click here for a one-pager on the impact on local control. Click here for a one-pager on the stability of property taxes. Click here for a one-pager on delinquent taxes. Click here for a one-pager on remaining property taxes. Click here for a one-pager on county inequity of funding. Click here for a one-pager on the shift from non-residents. York County School Consolidation Study: The IFO released its analysis of the impact of a proposed consolidation of the governance, tax base and administrative functions of the 15 school districts located entirely in York County. Overall, the report bolsters the argument that school consolidation is not a silver-bullet for achieving cost savings, and in fact, such consolidation creates a complex collection of winners and losers as the unique circumstances in each district are forced into a one-size-fits-all model. Read the IFO report on York County School District Consolidation. Act 164 of 2014: House Bill 1590 was signed into law as Act 164 of 2014. The Act requires basic training for tax collectors to be devleoped by DCED. Tax collectors must take the training and pass a test before they can take the oath of office as tax collector. The bill also contains a provision that requires criminal background checks of people running for tax collector. The bill also requires tax collectors to appoint a deputy tax collector to fulfill the tax collector’s role if he/she becomes incapacitated—this appointment requires the approval of the taxing district. Act 42 of 2014: House Bill 1513 was signed into law as Act 42 of 2014. The Act modifies the Local Tax Enabling Act to clarify the parameters for those that levy a business privilege tax. The Act clarifies that the tax may be imposed on those entities that do business in the taxing district for 15 or more calendar days per year and also clarifies that the "base of operations" must be an actual, physical and permanent place of business from which the taxpayer manages, directs or controls its business activities at that location. The bill was signed by Governor Corbett on May 6, 2014 and goes into effect immediately.